After a week of take-out, yogurt and peanut butter sandwiches, I went back into my kitchen yesterday afternoon and cooked for comfort. Cooked to soothe, cooked to remember and cooked to forget. It helped. I wanted pasta and I wanted it from Marcella Hazan. She lives on a canal in Venice, Italy and cooks....lucky lady. I could be very happy living on a canal in Venice, walking the local streets every morning to the market to buy food, greeting my neighbors in Italian along the way. If you have a chance, listen this this NPR story about her from 2010 - here. Spaghetti bolognese is rather simple: a mirepoix of onion/carrot/celery, ground chuck, white wine, whole milk, a dash of nutmeg, tomatoes and S&P. The process of gently cooking the mirepoix to the right temperature/ consistency and then waiting for both the milk and then wine to reduce down takes the longest in terms of hands on time. Once you add the tomatoes, you stir and walk away. Bolognese needs a long time to gently simmer on the stove and Marcella's recipe calls for three hours - I started early and let mine simmer for five. Go here for the recipe. Everyone was happy to have a home cooked meal in front of them when I called them to the table and it pleased me to watch them dig in and go back for seconds. 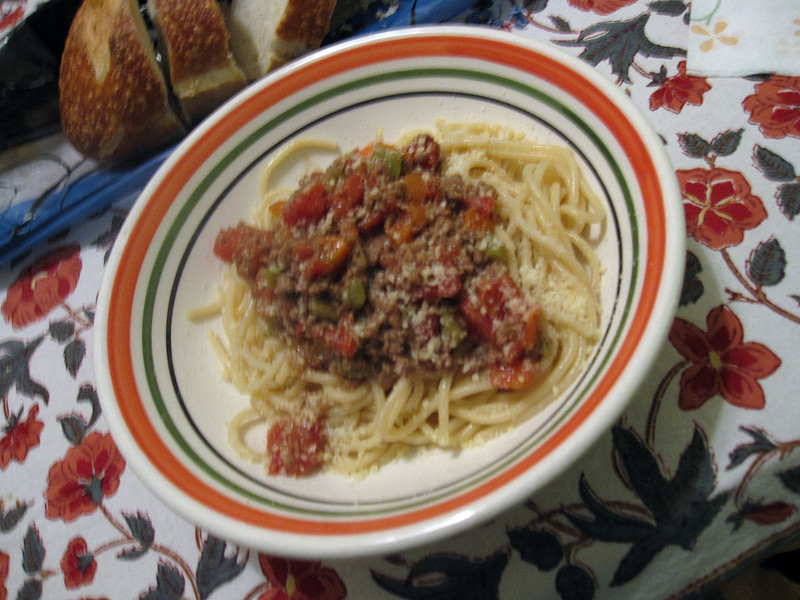 The spaghetti bolognese was warm and comforting - just what I needed to soothe myself at the end of the day. I'm linking up with Debbie's Tuesday at the Table feature - go see the cookies she has posted about today - they look fabulous! Good for you. Your family appreciates this in so many ways. Cooking therapy, it's a good way to start, and I have no doubt that your family was very appreciative. It looks yummy!